The grasses in here that look the most like fireworks are technically known as 'graminoids'. We left off last time talking about the "true" grasses, the Poaceae family, the largest and arguably most eatable group of grasses. Just as a recap, the term 'graminoids' is the more inclusive term for grasses and grass-like plants. Under that particular umbrella falls all of the true grasses, along with 3 other major families. The sedge family has about 109 genera. The most prolific genus in this family is Carex, with about 2,000 species. While not as widely edible as Poaceae, water chestnut is in this family, as well as Papyrus (that stuff the ancient Egyptians used so prolifically!). Distinguishing features include solid, triangular stems (with a few exceptions), and leaves that are spirally arranged in 3 ranks. "Sedges have edges" is a good way to remember this particular family. Though I've cut a cross section to make it easier to see here, the distinctive triangular stems are noticeable as soon as you roll a stem between your fingers. Looking like nothing so much as a burst of fireworks, this Yellow nutsedge has both beauty and edibility (it's Latin name, Cyperus esculentus, essentially translates to 'edible sedge'). The rush family has about 8 genera, with about 400 species. While not particularly famous for it’s uses in modern times, this plant used to be very illuminating. For many thousands of years before the lightbulb, these grass-like plants were used as a source of light in the form of rushlights. These are bundles of dried rush bound together tightly, and then often soaked in fat. Those cave paintings in Europe? They were at least partially drawn with the aid of rushes. They can tell from the scorch marks and the rush fragments where the charred bits where scraped off. The ancient artists who made these cave paintings in Lascaux in Southwestern France most likely had some of their illumination provided by torches made from Rushes. Think about that the next time your mowing the lawn. Distinguishing characteristics for this Family include round stems and sometimes lily-like flowers (with what’s called ‘tepals’-petals and sepals that look much alike). In the case of many Juncus species, you’ll see a little flag sticking above the flowers. This looks very much like a continuation of the stem, but is in fact a bract under the flower. Note the little flag at the top of this Juncus stem, over the flowers. While it may look like the stem just keeps going, it's actually a modified bract giving us a little wave there. Of all the graminoids, rushes have some of the most spectacular flowers. 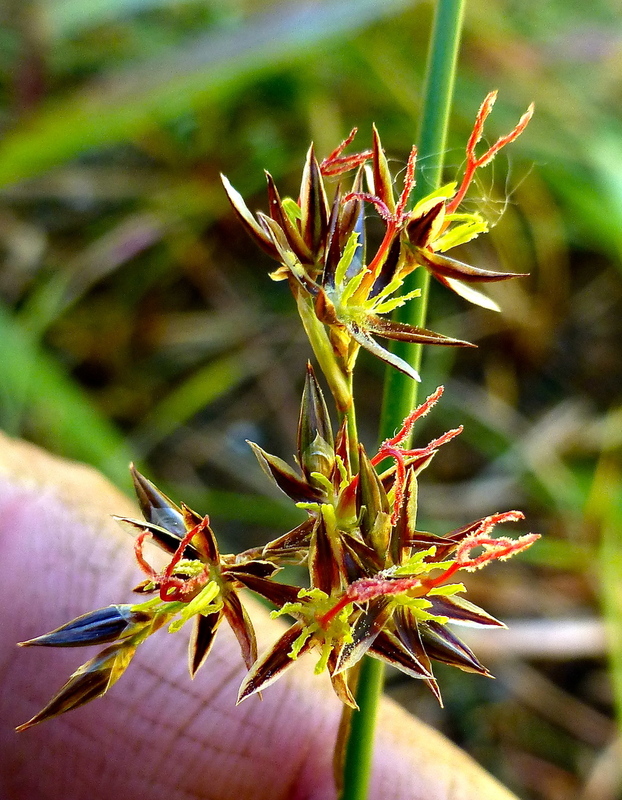 This Juncus arcticus, or Mountain Rush, puts on a scandelous show with it's multicolored stamens and pistils. You can also see the purply-brown tepals making a star like pattern below all the colorful bits. Found this beautiful creature by a mountain stream. Wetland areas are common places to find rushes, though they can be found in drier areas as well. Up until recently, the cattail family had just one genus, Typha. More recently the APG III system has added on Sparganium or bur-reed. Typha, or cattail, are found almost always in aquatic or semi-aquatic habitats, such as wetlands, riverbanks, and ponds. Distinguishing characteristics include flat, hollow leaves, and flowers in distinctive, hotdog-like spikes (called ardenscanisate- I know, yikes, talk about a mouthful). A charasmatic graminoid to be sure, the female flowers of cattail develop into the "hot dogs" seen almost year round atop the stems. You'll notice the thin remnant of a stem at the top where the male flowers once were. Typha flowers have both male and female parts on the same stem. The interesting bit though is that the male flowers are all at the top of the spike, while the females are on the bottom. Very patriarchal I know. But don’t despair ladies. The male flowers do not persist, eventually leaving only the female flowers to mature into seeds. Also, Typha have aeryenchyma, hollow structures within the stems and leaves, which help with flotation and transport of oxygen to roots. The hollow structures in the leaves and stems of cattails are called aerenchyma. These crazy looking chambers allow air to be transported to roots when they're covered in water (think of it like a snorkel for plants). Sedges, rushes, and actually a whole bunch of other plants that live in or near water also have these, including water lilies and lotus. If you have a minute, and perhaps a magnifying glass or hand lens, these are really neat structures to investigate! And Cattails... look like cattails.